Find the answers to all your questions right here! Lots of good things to know before you go. Know before you go! Height requirements, park policies, and safety regulations are strictly enforced for the safety and comfort of all of our guests. To all guests using phone or tablet apps while in the park, for your safety as well as other guests, please be aware of your surroundings at all times and maintain a proper lookout for other patrons and attractions. There are areas of the park where guests are not allowed to enter, so please be aware of those areas and abide by the rules of the park. 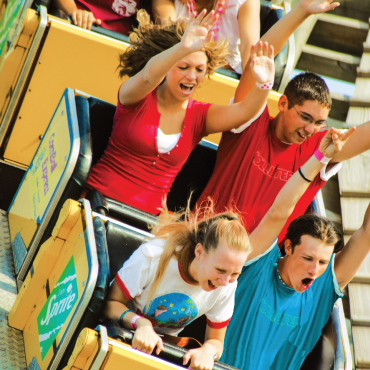 We do not allow handheld cameras or cell phones on some rides. Please read the posted rider safety signs for each attraction before participating. Thank you. Cooked to order gourmet burgers. Also serving chicken strips and pork tenderloin. Our famous homemade carmel popcorn, an Indiana Beach tradition. Delicious variety of hot dogs. Featuring Nathan's famous hot dogs. Coldest drinks on the boardwalk. Several flavors to design your own special taste. Our funnel cakes and stuffed pretzels are sure to please any hankering you have. The Original Corn Dog. It's a meal on a stick. An Indiana Beach favorite. The World's Best Tacos. Featured on The Food Network. Buy them by the dozen. An Indiana Beach sweet treat tradition. You can't go home without trying one of these. A large selection of Indiana Beach shirts, collectibles, towels and other essentials you need while visting Indiana Beach. The official Indiana Beach souvenir shop. Don't leave the park without an Indiana Beach souvenir to remember your special day. One of a kind airbrushed t-shirts hats, and other personalized souvenirs. Remember your day at Indiana Beach with a custom drawn caricature by our creative artists. Custom henna and airbrush tattoos and face painting created by our experienced artist. Get that unique, hip and funky look with your very own custom hair wrap. Create your very own custom vinyl deals and stickers. There is a General Admission fee of $41.99 for guests 48" and Over, $26.99 for guests Under 48", and $21.99 for Seniors. Children two years of age and younger are free. Visit the Tickets & Passes page for all other Funday and Season Pass information. Prices are subject to change without notice. Please see our Tickets & Rates page for a list of our ticket prices. Indiana Beach is a complete vacation destination with a variety of accommodation options. There are campgrounds for RVs, tents, or cabin camping, Hotel accommodations, water front chalets, cabins, cottages, and condos; any type of accommodation to fit your relaxation needs. Do we have any shows? 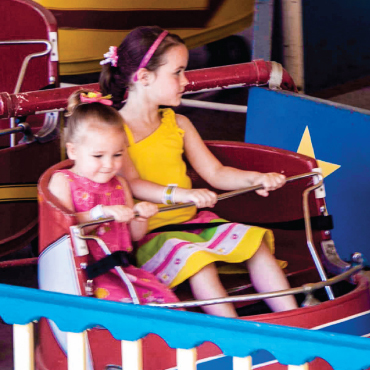 Indiana Beach Boardwalk Resort offers a variety of events throughout the summer, in addition to our Fireworks shows on Memorial Day, 4th of July and Independence Day. Please visit the Shows and Events page for upcoming events and show times. Do you have strollers or wheel chairs for rent? Yes, Single Strollers are $6.00/day, Doubles are $8.00/day, Wheel Chairs are $12.00/day, and Electric Wheel Chairs are $30/day. Yes. Electronic lockers can be purchased at any ticket booth or at The Bathhouse located on the Boardwalk. Lockers are available in several locations in the park. Standard lockers are $8.00/day and Large lockers $12.00/day. What are the height requirements for your rides? Please visit our Attraction for all rider height, age, and/or weight requirements. Are we allowed to bring food or drink inside the Amusement Park? No outside food or drink is allowed into the park. Check out all of the dining and snack options available at Indiana Beach here. What special promotions/discounts do you offer? We offer a variety of discounts, please click here for a current list of discounts. Sign up now for our eNewsletter to get more information directly in your inbox. How do I get to Indiana Beach? Please visit our Direction Page for directions from Chicago or Indianapolis. What are the Shafer Queen cruise times? Cruise times may vary, but they are posted at the Boardwalk Dock daily. The Shafer Queen is a large double decker paddlewheel driven excursion vessel taking two 75-minute trips daily to showcase upper Lake Shafer and 30-minute trips to lower Lake Shafer at frequent intervals. Do you offer boat rentals? For the safety of our guests and team members, some attraction may have to close in rain or extreme weather. Once the weather has passed and it is safe to do so, we will do our best to reopen any closed attractions. Due to the wide variety of activities, Indiana Beach does not offer rain checks or refunds. Our RV Resorts are pet friendly, however; pets are not allowed in the amusement park, Hotel, Motel or cottages with the exception of service animals. What is your Waterpark dress code? Dress code information for the water park and amusement park can be found here. We accept Cash, Visa, MasterCard, American Express, Discover, and Traveler's Checks. Traveler's Checks are only accepted at the ticket/ admission booths. Yes there is, but you can visit our Cool Cash Card kiosks to load funds onto a Cool Cash Card. The Cool Cash Cards work just the same as cash and are accepted anywhere in the park for food, games, merchandise and rides. 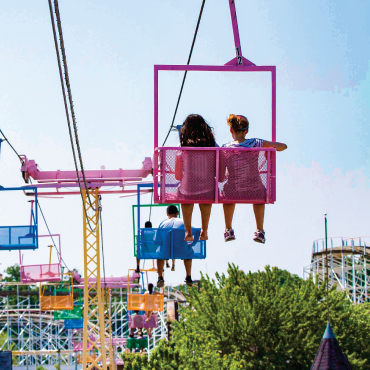 Cool Cash Cards work great with family members who want to visit different areas of the park at the same time and offers convenience so you can enjoy your day at Indiana Beach. Don't worry- if you lose your card, just make sure you have your receipt and we can track the purchases and balance and issue a new card! You can also load funds to a Cool Cash Card online here, at Guest Relations or any ticket/ admission booth! Tickets and passes are non-refundable and non-transferrable once purchased, processed, and/or redeemed. No, Indiana Beach is a pay one price facility. 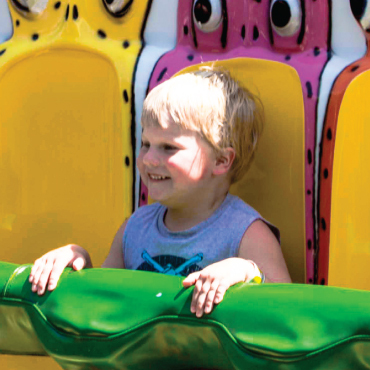 Because of the breadth of entertainment offered for all ages, Indiana Beach maintains the pay-one-price policy for all Guests to enjoy the rides, slides, and other entertainment. Visit the Tickets & Passes page for all other Funday and Season Pass information. Free parking is available in the north and south lots. Paid Premium and handicap-accessible parking is available in the lower north lot, including a limited number of free handicap-accessible spots. Parking for the VIP lots cost $10. Is my previous purchased promo ticket still good? All valid Indiana Beach Amusement & Water Park Resort tickets have an expiration date printed on the ticket. All tickets without a printed expiration date are not valid. All admission tickets are only valid for the year of purchase. Where can I purchase a season pass? Season passes are available Online or from guest relations on-site at the park. I already bought a season pass, then a promotion was run. Can I get a refund? Unfortunately, we do not give out any refunds for missed promotions. All special promotions are timely and expire at the times and dates determined by management. Once a promotion has expired, that price offered is no longer valid. How can I get in touch with Indiana Beach? For any questions or concerns, please call 574-583-4141. A dam was built creating Lake Shafer, near Monticello, Indiana. Earl Spackman took his family to the new Lake in hopes of purchasing a lot to build a vacation cottage. While the location was beautiful, the sharp banks of the artificial lake made finding a place to swim in the waters impossible. The dam and the creation of Lake Shafer were big projects for the Indiana area. Travelers would often pass by to see the new lake and view the on-going venture. With an announcement that Lake Shafer would be lowered to provide water for Lake Freeman, Spackman was struck with an idea: People wanted a place to swim and he was going to give it to them. Using a horse and wagon, 2x4s, and a shovel, Earl Spackman and others literally created a beach along the shores of Lake Shafer. In addition, the crew built a bathhouse for guests to change in and a small refreshment stand. In 1926, Ideal Beach opened to the public with a 12 year-old Tom Spackman working hard behind the counter of the refreshment stand. In 1927, Ideal Beach added some excitement to its lineup with the arrival of a pair of Toboggan Slides. Guests would drop nearly 30 feet downhill aboard these popular thrill attractions, and then skip across the Lake Shafer water. With its first successful attractions in place, Ideal Beach still needed to grow. Spackman knew the more attractions he had in place; the more guests would flock to the Beach and stay for a while. With no master plan in place, it seemed to grow on its own. However, after noticing a small successful dance floor on the other side of the lake, Spackman made one addition in 1930 that stood out from the rest and began a tradition that remains through the present day. A new dance floor was the centerpiece of the legendary Ideal Beach Ballroom. The floor hosted evening dances for guests and residents of the surrounding area. Still in use today, it continues to play host to many special events at the Beach. But, in the '30’s, the Ideal Beach Ballroom was a home to the growing Big Band Era. Expanding twice, the Ballroom quickly became one of the major attractions. Tom Spackman took over operation of Ideal Beach when his father passed away in 1946. Branching-out the appeal of Ideal Beach, Tom introduced the Beach’s first permanent rides in 1947. The arrival of the Ferris Wheel, Merry-Go-Round, and Roll-O-Plane (also called The Bullet) delighted guests with every ride. Unique to Ideal Beach’s lakeside location, guests could also be thrilled aboard the Wahoo, Jr. ... a Chris Craft speed boat which rocketed guests across the waters of Lake Shafer. For Tom Spackman’s vision to continue and grow, he knew more people had to come to Ideal Beach. Knowing the immediate area did not have enough population to support the growth, Spackman had to figure out a way to attract more people ... with many people not knowing where Ideal Beach was. Spackman wanted people to know that they could come to Indiana to have fun and enjoy a vacation, he wanted them to know everything that the Beach paradise had to offer, and he wanted them to know where in the world Ideal Beach really was. To accomplish this, in 1950, Tom Spackman elected to change the name from Ideal Beach to Indiana Beach. The name change made certain that guests were able to tell their friends and family exactly where they had been. But that was only part of Tom Spackman’s mission. People had to know about Indiana Beach, they had to hear about it and all it had to offer and pay attention to what they heard. He wanted them to come, for a day, for a weekend, for a week ... but that required getting their interest in any way he could. Knowing he couldn’t rely on just word of mouth and the window cards of old, Tom came up with promotions, or stunts, to attract attention to Indiana Beach. Some of the best included high-wire acts, escape artists such as The Great Pasha, a man being shot out of a cannon, a promotion welcoming extra-terrestrials to the Beach, and an ex-G.I. living under water! With attention from the name change and his outlandish stunts, Tom Spackman, Sr. continued to develop his family’s paradise amongst the Indiana Cornfield’s. The “Riviera of the Midwest” was the title which suited Indiana Beach perfectly. Spackman strived to continue to create & maintain this ideal paradise for his guests. Keeping that central idea in mind, Indiana Beach gained its first icon on the lake with the arrival of the Shafer Queen in 1961. A beautiful paddle wheeler, the Shafer Queen took guests on guided tours of the area surrounding Indiana Beach. The original Shafer Queen was retired in 1972 and became a lakeside restaurant known as The Pronto Princess. The new Shafer Queen was designed by master craftsman Bill Luse and began carrying passengers in 1973. Today, the Shafer Queen remains the largest regularly scheduled paddle wheel boat in Indiana. Other rides and attractions were added over the years including the Dodg’em, Antique Autos, the Scrambler, and the popular Mystery Mansion haunted house dark ride (now The Den of Lost Thieves). In 1966, Spackman’s imagination expanded the park even further over the waters of Lake Shafer with the addition of the largest suspension bridge in the Midwest. Connecting the Boardwalk Funway to the new south parking lot, the footbridge was a path directly over the lake for guests to arrive at Indiana Beach and take in the spectacular view of the surrounding area along the way. In 1971, Indiana Beach forever altered its skyline when it received its first ever roller coaster: The Galaxi. In 1985, Indiana Beach adopted its enduring mascot, IB Crow, and his identifying catchphrase, “There’s More Than Corn in Indiana! A far cry from the classic banner that “The Riviera of The Midwest” had given Indiana Beach, “There’s More Than Corn in Indiana!” succeeded in making the paradise readily identifiable to the public. The reach of the campaign, the popularity of the slogan, and the versatility of IB Crow grew exponentially over the years. The arrival of IB Crow and the uncanny success of the new campaign brought people like never before to Indiana Beach. Now drawing heavily out of Indiana, Illinois, Ohio, & Michigan as well as several other states, Indiana Beach was being discovered as the paradise in the middle of a cornfield. With more people came a need for more attractions. After 60 years, the Beach itself was still the centerpiece to the park, but Spackman saw a need to add more water fun & excitement. In 1987, Indiana Beach added a Waterpark. Given special constraints, all of the water slides and the long Action River had to be literally constructed over and in the waters of Lake Shafer. In early 1994, Indiana Beach announced its plans to build a wooden roller coaster. Being the first one to be built in the state in over fifty years, and, at the time, the only wooden roller coaster in the state, the announcement was groundbreaking for both Indiana Beach and the state of Indiana. To give the Hoosier Hurricane a unique feel, and help with the space issues, the majority of the coaster was built directly over Lake Shafer with many of the drops designed to bring riders down to the edge of the water. Tom Spackman, Sr. got a firsthand view of his design work as he took the very first ride aboard the Hoosier Hurricane on opening day, May 27, 1994. A unique and exciting out-and-back coaster, The Hoosier Hurricane was the perfect addition to Indiana Beach’s lineup of attractions and it was a ride like no other. Several new additions started popping up over the next few years. The 1992 addition of the Water Swing let guests glide on the wind over Lake Shafer. 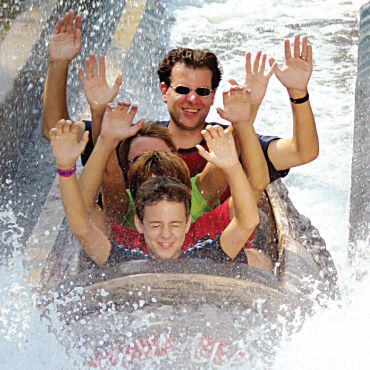 The wild Big Flush water coaster delivered wild water fun to any who braved its twists and turns. The exciting Double Shot and giggle inducing Frog Hopper rides arrived in 1999 to the delight of thrill-seekers of all ages. Even IB Crow received a ride in honor of his name as Air Crow took to the skies and let guests pilot their own crow over the water. For the Safety of our guests, we reserve the right to inspect all bags, backpacks and other containers brought into the park. Alcoholic beverages are not allowed on the Boardwalk Funway. Alcoholic beverages may not be carried out of the Skyroom, Roof Garden or Beach Brew. Glass containers are not allowed in Water Park and Sand Beach area. Weapons and sharp objects may not be carried onto park grounds. Running, unruly behavior and profanity are not permitted anywhere in the park. Pets are not allowed within Amusement Park gates, including Boardwalk, hotel and cottage units. *Service Animals are permitted. Indiana Beach operates on Eastern Daylight Savings Time. Dates, hours, prices, discounts and schedules are subject to change without notice. Indiana Beach is not responsible for lost or stolen items. Cut-offs are not considered swimwear and are not allowed in Sandy Beach, Splash Bash or Water Park areas. Shirt and shoes are required on all rides. All guests must wear shoes along the Boardwalk at all times, and shirts must be worn after 7 p.m. Clothing with inappropriate language or graphics is not permitted. Additionally, guests may be asked to cover graphic or inappropriate tattoos. Shoes must be worn in Amusement Park. Bare feet are not allowed except in Water Park and Sandy Beach. Children under 48” tall (without footwear) do not meet height requirements to ride the slides in the Water Park. No strollers allowed in the Water Park. Children under 48” are required to wear a Coast Guard approved life jacket. Life jackets are provided by Indiana Beach. To enter the Water Park, guests are required to have the Combination Ride and Water Park wristband. Absolutely no smoking in Sandy Beach or in the Water Park. No coolers or glass bottles are allowed in Sandy Beach or in the Water Park. Appropriate swimwear required. No thongs, cut-offs or tennis shoes allowed. The Bath House is provided for changing clothes. Changing on the beach is not allowed. All children under 14 years of age must be accompanied by an adult 18 years of age or older. Indiana Beach is a limited smoking facility. Smoking is permitted only in designated areas. Please see park map for smoking areas. Line jumping is prohibited. You must get in line at the marked ride entrance. Guests are not allowed to leave and return for any reason, hold a spot for someone else, join someone else already in line, jump any fences or chains or cut through the line. Violation of these rules will result in removal from park without refund or compensation. Free parking available in north and south lots. Paid Premium and handicap-accessible parking is available in the lower north lot, including a limited number of free handicap-accessible spots. Certain rides and attractions have restrictions based on height and/or size, as well as physical or medical conditions. Signs are posted at each ride entrance. Please follow these rules to ensure a safe experience for you and others. Use good judgement. Follow the directions of park staff and posted signs. Ride restrictions are subject to change without notice. Please abide by all Indiana State boating laws. Indiana Beach Boardwalk Resort is not liable for loss or damage to your boat while on Indiana Beach property.